Grey Cotton Jersey Founder's T-shirt for Men, "Grey Kuta Breeze"
This classic grey t-shirt for men is sewn of slightly sheer and super-soft cotton. With a fine gauge, the regular fit jersey t-shirt features a crew neckline and short sleeves with folded hem. 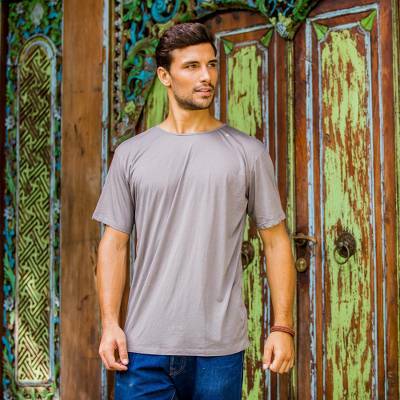 You can find men's cotton founder's t-shirt 'Grey Kuta Breeze' by Novica Collection in clothing categories such as Cotton Tees. Enjoy exploring these sections for other Novica treasures. Products feature the Novica logo to show support for Novica's mission and commitment to artisans around the world. Novica artisans from around the world are collaborating in the creation of the Novica Collection. Showcasing the artisans' original talents, this collection features a variety of Novica branded logo products. Artisans are invited to be a part of the Novica Collection based on their specialty. Novica's dedicated team of professionals provides artisans with the logo, we work together on the selection of color and materials, and the artisans continue with the crafting process. The Novica Collection showcases a wide range of top-quality hand crafted products, and we conduct various tests and checks at each stage of production. This cooperation aims to provide good quality branded products characterized by their function and wearability, as well as giftable attributes. Products feature the Novica logo to show support for Novica's mission and commitment to artisans around the world.